It has been written that Lonnie Barron was born in a one-room cabin on a cotton farm in the northern part of Louisiana. A 1955 article mentions that was near the town of Forest. Lonnie's father was a sharecropper, which did not make things too easy for the family. When Lonnie was just three years old, his parents moved to Richton, Mississippi. He attended school up to the age of 14. Quitting school at such an early age was not at all uncommon back in those days. He did it so he could take on a job and help the family out. He first sang in church with his mother. When he was just twelve years old, he got himself work with his neighbors so he could pay for a guitar that cost the then princely sum of $4.98. It was those from his roots to Mississippi that fans came to know him as "The Mississippi Farm Boy." He continued to work at various odd jobs for about three years. Then came time to join the military service. He was with the U. S. Air Force for four years. Upon discharge from his duty as airman first class with Uncle Sam, he came back to Marine City, Michigan and began working at radio station WSDC. It was during this stint with the Air Force that he began his entertainment career, playing the clubs near where he was stationed in Indiana. Lonnie wrote to Country Song Roundup in 1954 as part of their big fifth anniversary issue that it was around 1949 when he was at the Selfridge Air Force Base in Michigan that he started down the musical path. He thought since it was a northern state, country music had room to grow. He took it upon himself to enter a talent contest on a local television station he wrote; he won three straight weeks. That led him to thinking that fans enjoyed his type of music if given a chance to hear it. That led to a stint with radio station WDOG out of Marine City, Michigan. 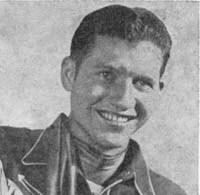 Lonnie wrote in 1954 that he had his own band since September 1952 and did personal appearances throughout the Richmond, Michigan area. Back in 1954, Lonnie would do a one-hour show over WSDC Monday through Friday. On Saturdays, he entertained fans for two hours. A 1954 article mentioned he had his eyes on a recording contract. While at WSDC, he also was appearing on the "Big Barn Dance Frolic" show that aired over WJR out of Detroit, Michigan. His notes in a 1954 article indicate that this show started up around 1950 or 1951 and only ran for a couple of years. He notes that Casey Clark picked up the vacuum withi his "Lazy Ranch Boys Barn Dance" show. Lonnie was a pretty versatile entertainer. He played steel guitar, mandolin, banjo and piano. They wrote, he did it all without ever taking a lesson on the instruments. He had a fan club at one time that was headed up by Mrs. D. J. (Kay) McNally in Marine City, Michigan. However, Country Song Roundup's editor wrote a few months later that the fan club president was actually Jeanne Kerr out of Port Huron, Michigan. In 1955, Lonnie was beginning to get some attention. Warren Wood noted in his piece of news from Flint, Michigan for Country & Western Jamboree that he had received a letter that was signed by over 100 fans talking up Lonnie Barron! Warren got to meet Lonnie along with Pat Turner from Sage & Sand. Warren noted, "...The Drums are starting to roll for Lonnie." "Young Lonnie Barron, DJ and singer, has a potential in Go On. Light, romantic side has pertinent theme about the swain who wonders what his approach to romance should be. Reverse side is a re-write of many lyrics and melodies of past h.b. (sic: hillbilly) tunes." But Lonnie's musical career was suddenly cut short in early 1957. Phillip Fortune wrote abruptly in his column in the July 1957 issue of Country & Western Jamboree in his "Did You Know That....?" column asking fans if they knew he had just been recently shot? Several other publications mentioned his passing. We recently heard from a fan, who took the time and effort to track down the newspaper articles from that tragic end to Lonnie's career. We'll try to summarize what those articles wrote. On Thursday, January 10, 1957, the Mount Clemens, Michigan newspaper, The Daily Monitor-Leader, had the shocking story of the shooting of disc jockey, singing artist Lonnie Barron. Marvin Simonson wrote of the scene reporting from Richmond, Michigan on January 9, 1957. At the time of the first reports, mystery was said to surround the death of Lonnie Barron at his home in Muttonville. Mr. Barron was apparently shot twice, once in the head and another in the left arm. The reporter inquired of friends and it was said that "The Mississippi Farm Boy", as Lonnie was known, "...did not have an enemy in the world." Detective Lyeford Smith of the ST. Clair State Police Post indicated that it appeared Lonnie was shot while trying to escape from the attacker through a bathroom door at his home. Mr. Simonson goes on to report that Lonnie's body was found in the bathroom by Paul Starkey, of Mount Clemens, who worked for Lonnie at Lonnie's dance hall, the "White Eagle Hall". His body was surrounded by boxes of fan letters. Lonnie lived on Gratiot Avenue, two miles north of Muttonville. Lonnie perhaps was getting ready to perform at the hall as he was dressed in ornate cowboy boots, a red western shirt and cream colored trousers. The reporter obtained the thoughts of Detective Smith as to the motives or potential suspects. Mr. Smith then theorized that "...jealousy might have motivated the murder inasmuch as Barron had dated some of his fans." The detective also noted that he was not dismissing a thought that "...a crank, with a dislike for hillbilly music could be the murderer." Even at that time, it was indicated that a 35-year old man from Lexington, who had a wife that was a zealous fan of Lonnie, was being held for questioning. "Lonnie worshipped people and I don't know that he had an enemy in the world. He didn't smoke, drink or use foul language and I personally know he read his bible every night." "Lonnie was the cleanest living fellow I've ever met. He left a wonderful impression on everyone and he had a marvelous future ahead of him." Mr. McNally also told the reporter that Lonnie was helping two younger brothers through tehological school and had purchased a cotton and tobacco farm for his parents back in Richton, Mississippi. The attorney for Lonnie Barron, Paul F. Mabley indicated that Lonnie was grossing $15,000 a year at the time of his death. If we use 1957 as the base year, that would be equivalent to just about over $107,000 a year in 2006 dollars. The attorney also noted that Lonnie was "about ready" to sign a recording contract with Columbia Records. We have read many times in old publications that of artists or groups that were "about ready" to be inked to such contracts, perhaps some of that was generating interest, and perhaps it could be true. Simonson again provides more details from Detective Smith who indicated that robbery did not appear to be the motive as nearly $200 was "left in plain sight around Barron's four-room house and the victim's wallet had not been touched." Mr. Smith indicated that it appeared Lonnie had been shot Tuesday night as he had been dead about twelve hours before the body was discovered on Wednesday. Lonnie also performed at various charitable functions or venues such as the Sigma Gamma hospital and other organizations in Macomb County, Michigan. At the time of his death, he had a regular radio show over WDOG in Marine City that aired at 11:00am. 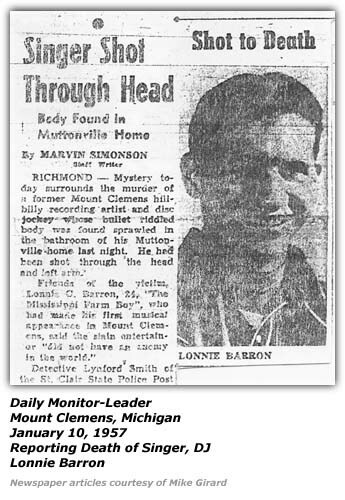 The Mount Clemens "Monitor-Leader" newspaper front page headlines on Friday, January 11, 1957 told readers of an arrest by the state police in the case of Lonnie Barron. The state police arrested Roger Fetting, said to be an unemployed carpenter from Lexington, Michigan, for the murder of Lonnie Barron. But the story reads as if the late breaking news was inserted into the story that had already been written for that edition. In an unattributed report, the article mentions that Edna Gunter of Detroit, said to be Lonnie's fiancee at the time of his death, pointed out that Lonnie was worried in the days up to his death - '...someone gunning for him'. Trooper George Bayse of St. Clair State Police post told the newspaper that three people had indicated that the suspect, Mr. Fetting, had called Lonnie and threatened Lonnie's life. It appears a letter that Mr. Fetting's wife had written to Lonnie, but had not yet mailed, was discovered by her husband, perhaps raising the emotions of anger and jealousy. Initial reports indicated that Mr. Fetting denied any involvement and stated he did not leave home after midnight on Tuesday. The story indicated that Detective Smith told the newspaper that Mr. Fetting's wife backed her husband up on this at the time. But another news reporter, William Saunders of Port Huron, was able to gain access to Mr. Fetting and apparently hear a confession from the suspect. It appears that Mr. Fetting told the reporter that Barron boasted of romantic interludes with Fetting's wife and sister. But as a bit more time went on, Mr. Fetting declined further comment and refused to make any further statements. Detective Smith again told reporters, "When we run this thing down, I think we'll find that it was someone who got good and jealous and a little liquored up and decided to do Barron in." A February 14, 1957 article in the Anchor Bay Beacon, indicated charges were reduced to manslaughter during an appearance in the courtroom of Justice Harry Nelson at the St. Clair County-City Building in Port Huron, by the then 36-year old Roger Fetting and his wife, Bettie, then 32. The article notes that over 300 spectators were present at the hearing. They heard Mrs. Fetting admit to "illicit relations" with the singer. They also heard Mr. Fetting's account of how he went to Mr. Barron's home on February 9 to take back the letters his wife had written to the singer. The article goes on, "When the well-known area performer taunted him, Fetting said, "I shot him." "
Justic Nelson determined during the proceedings that it was a "crime committed in a heat of passion" which provided the basis for the reduced charges. Lonnie Barron's body lied in state at the Robert Harley Funeral Home in Port Huron, Michigan. He was said to be dressed in a white gabardine cowboy suit with red piping, which had become his trademark. The Monitor-Leader reported that over 3,500 fans passed by the funeral home to pay their last respects to Lonnie Barron. His body was then taken to Richton, Mississippi, near his father's home, where it was buried. Hundreds more fans and perhaps some curious folks attended the last rites at the small cemetary. Hillbilly-Music.com wishes to thank Mike Girard for the effort he made to find copies of the newspaper articles used in our write-up of Lonnie Barron's career.